into Lighting was appointed by ASICS to work alongside interior designers Brinkworth to provide the lighting design for the largest ASICS retail store to date, which has recently opened on London’s iconic Regent Street and embodies the new concept retail approach for the brand going forward. 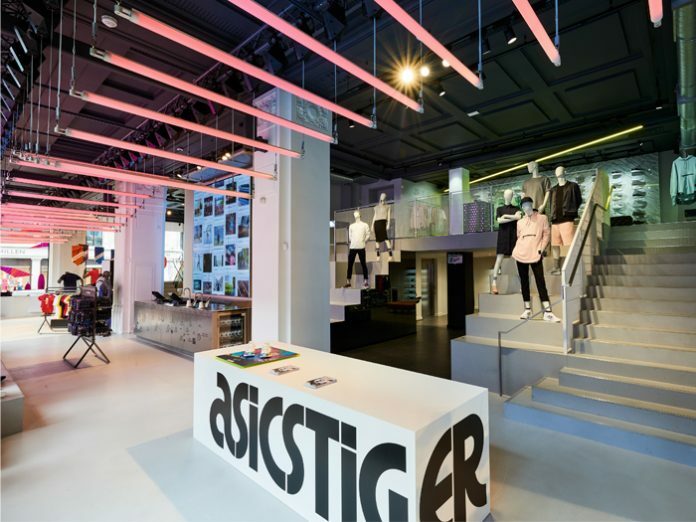 Featuring all four ASICS brands under one roof for the first time, ASICS, ASICS Tiger, Onitsuka Tiger and Haglöfs will now all be sold within this one store. into has worked as lighting consultants to ASICS for over six years, completing more than 90 stores Europe-wide, into Director Darren Orrow leads a team of five, comprising lighting designers and project managers to service ASICS as a client internationally. ASICS is an acronym of the Latin phrase ‘Anima sana in corpore sano’ – A sound mind in a sound body. As such, interior designers Brinkworth have created a concept that reflects the harmony of this philosophy and a store environment that balances the highly technical aspects of the brand (a sound body) with natural, warm finishes, features and materials (a sound mind). The concept offers consumers a fully integrated, holistic sports environment where both the mind and the body are stimulated. The ‘Sound Mind, Sound Body’ ethos of the brand will be consistently evident, with the use of living plant installations, sustainable products, natural wood finishes, LED lighting, and technology, as well as a complimentary juice bar and in-house DJ booth. The concepts within the store are a reflection of the innovation that has been at the heart of the brand since its inception. There are four ASICS MOTION ID zones, using sensors to capture each consumer’s natural posture and movement when running, to inform recommendations of product types best suited to them. A unique, state-of-the-art ‘robotic shoe delivery system’ has been introduced to enhance the delivery of products to the shop floor. Intuitive robotic arms placed in the shop window demonstrate key products and a striking kinetic lighting installation runs the length of the store, pulsating at the same pace as the heart rate of a 100-metre sprinter. Large-scale integrated planting within retail is not normally successful due to the lighting specifically required for product display. Brinkworth and into have worked closely with landscape experts to incorporate a bespoke lighting system, this provides the plants with the correct light in order to grow. A bespoke drip feed watering system has been developed within the long stainless-steel planters to ensure clean and safe installations. The retail furniture has been developed with RFP to deliver the best possible system for the ASICS product range. A modular post system provides a perimeter wall framework into which a whole range of display components fits inside, including integrated LED lighting, graphic backdrops, digital panels, racks, shelves and shoe stands. into were appointed by ASICS to work alongside Brinkworth to realise their joint vision for the lighting in this new concept retail flagship. 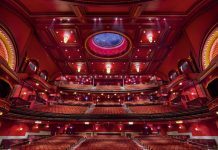 The lighting was to be as energy efficient as possible, all LED and tailored to different product types and displays, to help zone areas and to create a theatrical environment. The 9,040sqft, two-storey former French Connection store comprises of a vast ground floor area with two mezzanine levels and a basement level, complete with the ASICS motion ID and body scanner area. On looking through the store windows and entering the store, customers are greeted by a large-scale ‘wow factor’ bespoke kinetic lighting installation. This feature was developed, supplied and installed in conjunction with Skratch AV. The installation comprises a series of suspended RGB LED tubes on winches controlled via DMX to enable infinite colour change, chase patterns and a kinetic effect. A Madrix Luna 8 with a purpose-built program links to a Skratch Assist tablet control system to provide the store with a quick and simple method of controlling the light effects. The Skratch Assist tablet allows the store manager to turn the lights on and off with a simple tap, as well as changing between the pre-installed movement and light sequences. The accent lighting to the ground floor is provided by low glare, high level Reggiani Yori track mounted LED fixtures in a matte black finish, which has a minimal visual impact against the dark ceiling. These fixtures have been carefully located to work with the listed ceiling constraints of the venue. The fixtures have a colour temperature of 3000K and CRI 90 coupled with a 15-degree optic to provide focused illumination of the apparel merchandise, whilst avoiding light spill to the vertical surfaces to ensure the video wall and screens stand out and are not flashed with light. The mezzanine level to the right of the venue houses the ASICS Tiger brand. The accent illumination to the merchandise is provided by a smaller version of the track spot with a wide 47-degree optic, to accommodate the low ceiling height, in 4000K CRI 90 with a bespoke, diagonally suspended LED profile with yellow light to accentuate the branding. A cooler 4000K colour temperature has been selected here to accentuate the whites of the trainers on display and create a more daytime/fresher ambience for the ASICS Tiger area. The Onitsuka Tiger section is located below this mezzanine and is lit by recessed Reggiani adjustable LED downlights due to the low ceiling height. These fixtures have a colour temperature of 3000K and CRI 90 coupled with a wide 51-degree optic to provide good vertical illumination to the merchandise. The ASICS Performance area is housed under the mezzanine of the left-hand side of the store. 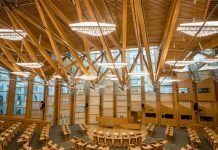 This area is defined by the timber slatted surfaces which draw customers into the space and surface mounted bespoke linear LED fixtures that have been integrated within the slats to provide a uniform ambient level of illumination. These fittings have been specified as 1-10V dimmable so that the light level can be locally controlled within the area after dusk. On the mezzanine above the Performance area sits a unique state-of-the-art ‘robotic shoe delivery system’ that has been introduced to enhance the delivery of products to the shop floor. This has been highlighted using a combination of track mounted LED spotlights in conjunction with a blue linear LED to frame the architectural opening within which the ‘robot’ sits. The open staircase leads you down into the basement to an additional ASICS Performance area along with the Haglöfs brand. The accent illumination to the merchandise is provided by further Reggiani adjustable track mounted fittings with a colour temperature of 3000K and CRI 90, with exception to the fixtures illuminating the trainer walls, these are in a cooler 4000K CRI 90 to accentuate the whites of the trainers on display, again helping to create a fresher ambience. The suspended feature planter display within the basement provides a key focal point and careful consideration has been given to the illumination of these as the correct colour temperature and diffusion of light is required to aid the plant growth. The glazed motion ID consultation area, which can be viewed from the store, is illuminated to a light level stipulated by ASICS via a surface mounted linear 4000K CRI 90 LED profile with track mounted adjustable spotlights to highlight the machinery. The combination of these provides an excellent uniform light whilst minimising any shadowing for the cameras. Changing rooms throughout the store are lit with a combination of recessed ambient LED downlights with an opal diffuser to soften the light and avoid glare, coupled with linear LED integrated into the mirror to provide a halo backlighting effect. Changing room lobby areas are lit by bespoke recessed LED profiles integrated within the timber ceilings. 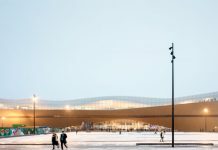 The New Global Retail concept is currently rolling out with completed flagship stores including Amsterdam, Paris, Cologne, and New York Firth Avenue, all with lighting design by into. The interiors and lighting concept is scalable for smaller outlet stores and concessions. Some stores feature unique, site-specific add ons such as a yoga studio, exercise studio and juice bar.